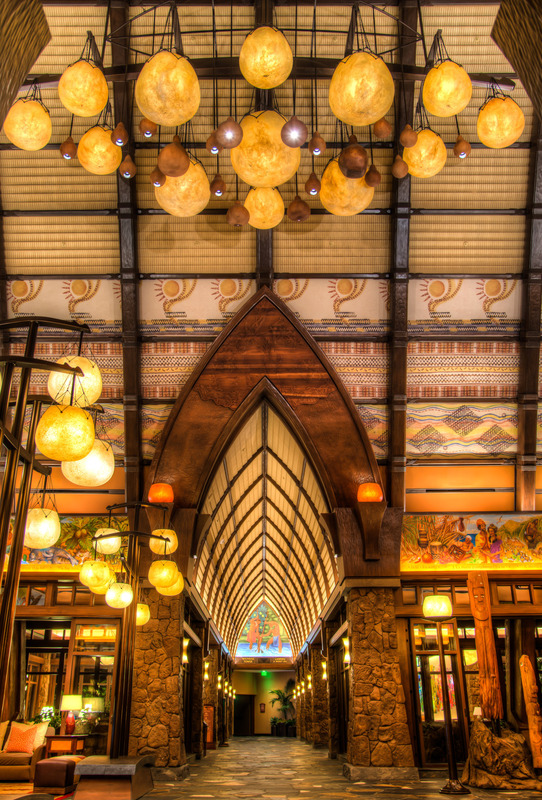 When we arrived at the Aulani resort in Hawaii I was struck by how beautiful the lobby was. Due to a combination of both jet lag and children I woke up before sunrise and ran down to the lobby. I set up my Nikon D800 and grabbed a series of exposures. I have been using a light weight tripod that's really not meant for the hefty Nikon D800. It's the Slik tripod that I'd been using with the much smaller Sony NEX-7. I had quite of bit of shaking to deal with even with using the timer mode. I wanted to get these shots when no one was around. One worker was cleaning the windows and remarked that he'd never really paid much attention to how beautiful this lobby was. He said he hadn't thought about it until he noticed me taking photos. Amazing what a little perspective will do. Maybe he'll have greater appreciation for the windows he's cleaning.